Assange arrested: The Ecuadorian government has removed Julian Assange’s asylum status and he has been arrested in London. We expect him to eventually be extradited to the U.S. Assange is a controversial figure; Wikileaks has exposed all sorts of confidential information that governments would prefer to keep secret. His leaks seemed to take a partisan direction in the 2016 election. Thus, he has lots of enemies. It will be interesting to see how he gets prosecuted. Central banks: Yesterday, the ECB and the Fed gave us essentially dovish signals. As we noted yesterday, the ECB told the markets it has other tools to support the Eurozone economy. The Fed strongly suggested that policy would be on hold for the rest of the year. In our 2019 Outlook, we named a monetary policy error as one of the four risks facing the financial markets. It appears we can assume that this risk has been eliminated. 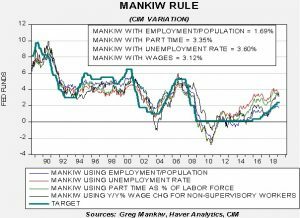 Mankiw Rule update: The Taylor Rule is designed to calculate the neutral policy rate given core inflation and the measure of slack in the economy. John Taylor measured slack using the difference between actual GDP and potential GDP. The Taylor Rule assumes that the Fed should have an inflation target in its policy and should try to generate enough economic activity to maintain an economy near full utilization. The rule will generate an estimate of the neutral policy rate; in theory, if the current fed funds target is below the calculated rate then the central bank should raise rates. Greg Mankiw, a former chair of the Council of Economic Advisers in the Bush White House and current Harvard professor, developed a similar measure that substitutes the unemployment rate for the difficult-to-observe potential GDP measure. This month, all the models are showing a drop in the estimated target rate. Three of the models would still suggest the FOMC is behind the curve and needs to be increasing the policy rate. 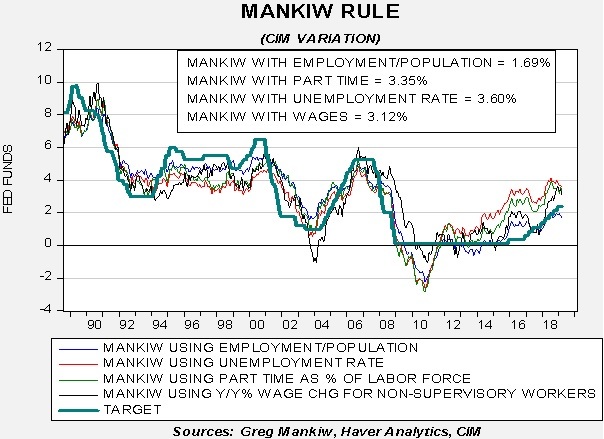 However, the employment /population ratio implies a rather high level of slack in the economy and would suggest the Fed has already lifted rates more than necessary. Given the uncertainty in the economy, coupled with political pressure, we expect the FOMC to remain on the sidelines. Brexit: As has been the case during this whole event, the extension was a compromise. Macron wanted a very short extension as did PM May. Most of the EU wanted to extend the deadline up to a year. They split the difference, with the deadline being moved to October 31 (we suspect the irony was lost on the participants). The U.K. will participate in European elections, although the EMPs won’t necessarily stay very long. So, the good news is that, just maybe, we won’t have to talk about Brexit every day for a while. Still, the whole process (or lack thereof) has been painful to watch and perhaps all of it has missed the real issue. Those of us who live in democracies have become habituated to the notion that compromise is possible on every point of contention. To some extent, that is what makes democracy work. The American founders created a divided government that would foster compromise. But, there are some issues for which compromise probably isn’t possible. Slavery turned out to be one; that was resolved through war. The two-state solution in Israel probably isn’t workable because both parties claim the same land as theirs. With Brexit, there really isn’t a workable middle ground. All the solutions that avoid a hard break put the U.K. in a less advantageous position than it would have been by simply remaining within the EU. So, the real decision is to either stay or leave abruptly. From an economic standpoint, it is hard to see how the U.K. will be better off with a hard break, but socially and politically it might be. It is natural for politicians to try to find a middling solution that would give most of the benefits of being in the EU, while satisfying those who want to leave. However, that natural inclination is probably not bringing us closer to a resolution. Polls suggest the U.K. public is closely divided on leaving. This problem may lead to another referendum but, even if the results are reversed, the British public will remain divided. From a market perspective, in the short run, staying in the EU is the better option. In the long run, it isn’t as clear cut; if Germany doesn’t accept the role of regional hegemon and start absorbing EU domestic demand (in the form of a trade deficit), then the EU could devolve and therefore leaving early might have its advantages. In light of this news, the financial markets are mostly unchanged. The EU does one thing really well—it delays hard decisions. It would not surprise us to see another delay around Halloween. So, the financial markets are assuming the status quo continues. It’s probably the right call. Trade news: There are reports that the U.S. and China are planning to create enforcement offices to monitor any trade agreements. Although this doesn’t eliminate all the potential sticking points, it does resolve an important one. Cain in trouble: Although the Trump administration hasn’t completed the vetting process for Herman Cain’s nomination for the Fed, Senators Romney (R-UT), Murkowski (R-AK) and Gardner (R-CO) have announced they won’t support his nomination. Assuming all Democrats oppose his nomination, the loss of one more Republican will doom his chances. Interestingly enough, the controversy surrounding Cain has reduced opposition to Stephen Moore. If Cain fails, we would not be surprised to see Larry Kudlow get the nod. Dalai Lama hospitalized: The Dalai Lama is in a New Delhi hospital with a chest infection. Although his condition is considered good, the news does raise questions about his succession. The CPC has always considered the Dalai Lama a threat because he represents a power that the party can’t control. China has consistently indicated it wants to approve the next Dalai Lama, which means the Buddhist designation process would be subsumed under the Chinese state. Australian elections: Australia will hold elections on May 18. Current polls suggest that Labor is favored 53% to 47% in a two-party race, but the Liberal-National Coalition (conservative incumbent government) holds a small lead in a multi-party race. 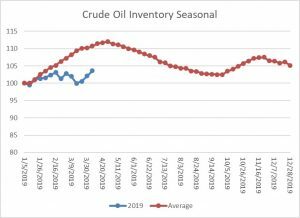 Energy update: Crude oil inventories rose 7.0 mb last week compared to the forecast rise of 2.5 mb. In the details, refining activity rose 1.1%, near expectations. Estimated U.S. production was unchanged at 12.2 mbpd. Crude oil imports fell 0.2 mbpd, while exports fell 0.4 mbpd. 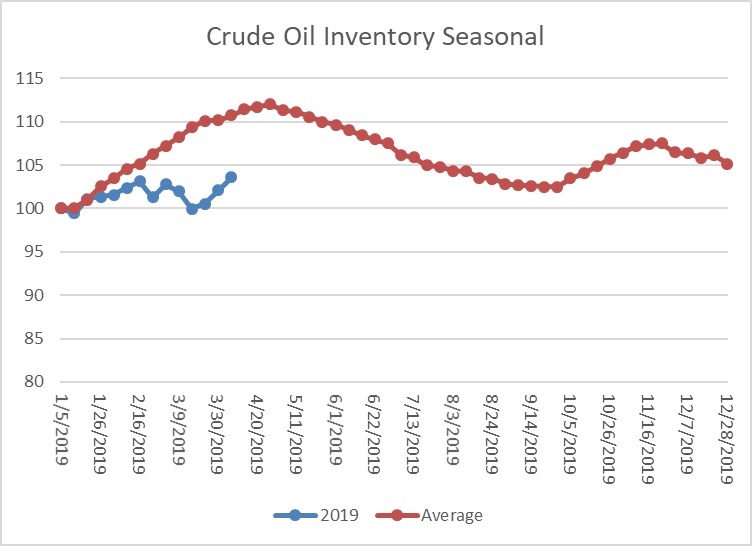 This is the seasonal pattern chart for commercial crude oil inventories. We are nearing the end of the spring build season and will probably not achieve average, although the gap has narrowed significantly over the next two weeks. 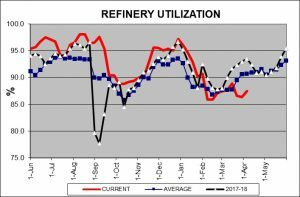 Refinery activity is still lagging average. 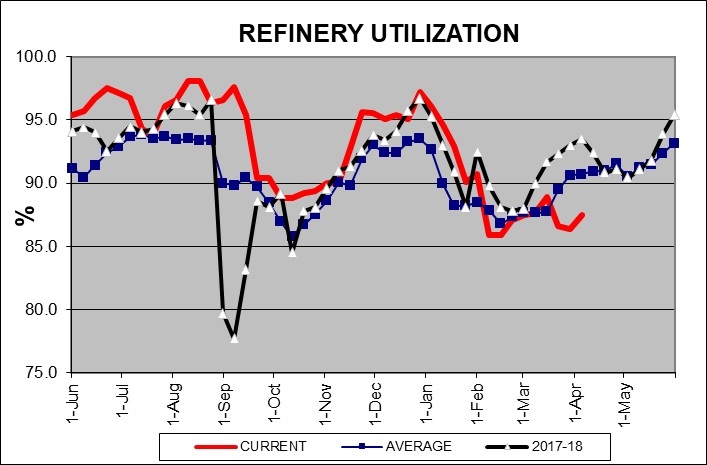 Usually by this week we are seeing utilization above 90%. Given the 7.2 mb decline in gasoline stocks, we would look for rising utilization in the coming weeks. Based on oil inventories alone, fair value for crude oil is $55.33. Based on the EUR, fair value is $51.99. Using both independent variables, a more complete way of looking at the data, fair value is $52.27. Current prices are running well above fair value. Geopolitical risks, including the unrest in Libya, continued problems in Iraq, falling Venezuelan output and the upcoming decision on Iranian oil export waivers, are lifting prices. However, our data does suggest the markets are getting a bit rich, so evidence that any of these situations are improving will likely lead to a pullback in prices.